China and the two Koreas have criticised Japan's new defence guidelines approving its first aircraft carriers since World War II, a plan that is also divisive domestically as observers warn of a regional arms race. Yesterday, a group of about 230 Japanese academics and lawyers issued a joint statement to strongly protest what they saw as wanton defence spending just to mollify security ally United States, as areas like social spending suffer cutbacks. Japan's fiscal debt of 196 per cent its gross domestic product is the worst in the world. 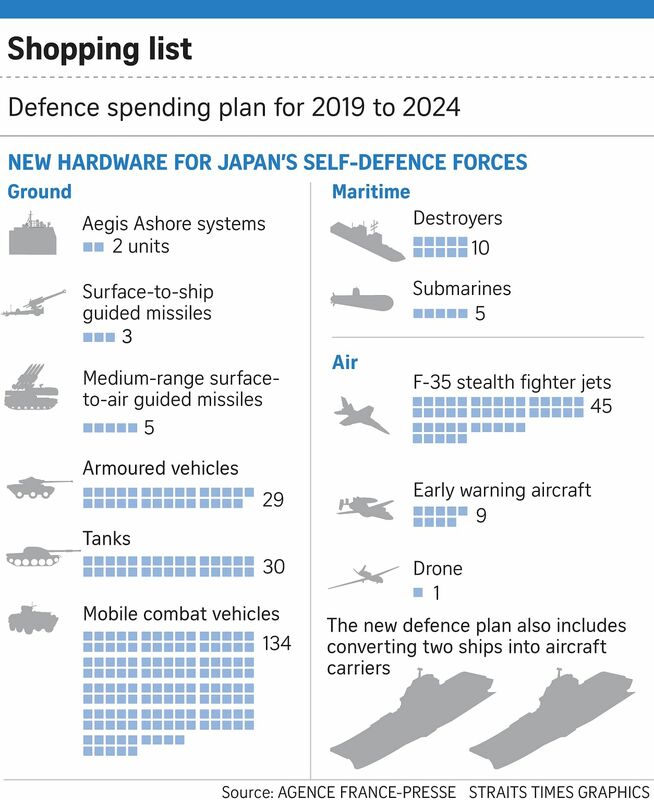 Japan's Cabinet approved on Tuesday a record five-year defence budget of 27.47 trillion yen (S$336.4 billion) from April, up by nearly three trillion yen from the current period. It also gave the nod to plans to retrofit its two Izumo-class helicopter destroyers into aircraft carriers, and place big-ticket orders from the US. In doing so, Japan cited Chinese military assertiveness as a threat - a claim that Chinese Foreign Ministry spokesman Hua Chunying said was baseless. "Japan has responded to (China's) normal national defence construction and military activities with a Cold War mentality, playing up the so-called China threat theory," she said. "For historical reasons, Japan's actions in military security have greatly concerned its Asian neighbours and the international community." But Dr Qian Feng, a research fellow at Tsinghua University's National Strategy Institute, told The Straits Times that it was "more important for China to watch what Japan does than what it says", given that Japan is bound by its alliance with the US even as it seeks better ties with China. "Improving one's defence budget for a new generation of weapons and equipment is reasonable, and there's no need to make a fuss about nothing," he added. In Seoul, South Korean foreign ministry spokesman Noh Kyu-duk said Japan's policies should be enforced under the framework of its pacifist Constitution. Two North Korean newspapers weighed in. The Minju Joson said Japan was "going to betray its true colours as a militarist basilisk", while the Rodong Sinmun called Japan's exclusive defence principle "phoney" for being a smokescreen to beef up military muscle. Japanese media across the political spectrum also chimed in. The liberal Asahi Shimbun said there was an "alarming rush to militarisation" that could spark a futile arms race - and that the introduction of aircraft carriers crossed a red line that previous governments have said would violate the pacifist Constitution. But the conservative Yomiuri daily said that given morphing threats, Japan must be flexible instead of sticking with long-held views. The left-leaning Mainichi daily concurred, saying that the "implementation of the defence-only policy can change depending on the form of threat". But all three papers were united in training their cross hairs on the ballooning defence budget, while, in a statement of protest, Japanese scholars and lawyers questioned the huge defence outlay even amid cutbacks on social security and reductions to the education budget. Mr Koichiro Tokuoka, an attorney-at-law, told a news conference: "We are not saying that the defence budget should be zero, but that it should be reasonable. The current trend reminds me of the Aesop's fable The Frog And The Ox, in which a frog tries to inflate itself to the size of an ox but then it bursts. We need to ask if we are buying what is really needed for our country's defence, or if we are buying just what (US President Donald) Trump wants us to buy?"